Chanteur Country US né le 6 Septembre 1939 à Akron (Ohio). David Allan Coe traîne derrière lui un lourd passé de délinquant; il fut condamné à mort pour avoir tué un autre détenu dans un pénitencier. Il ne dut la vie sauve qu'à l'abolition de la peine de mort et en 1967, libéré sur parole, il commence une prodigieuse carrière et en 1968 sort son premier album. 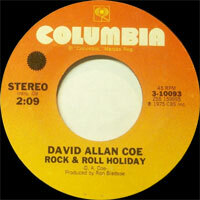 Guitariste, harmoniciste, compositeur doué et Vocalsiste attachant, David Allan Coe, le Cowboy tatoué, est l'exemple d'une réinsertion sociale parfaitement réussie. A life-long renegade, singer/songwriter David Allan Coe was one of the most colorful and unpredictable characters in country music history. One of the pioneering artists of the outlaw country movement of the '70s, he didn't have many big hits -- only three of his singles hit the Top Ten -- but he was among the biggest cult figures in country music throughout his career. Born in Akron, OH, Coe first got into trouble with the law at age nine. As a result, he was sent to reform school. For the next 20 years, he never spent more than a handful of months outside of a correctional facility -- he spent much of his twenties in the Ohio State Penitentiary. Released from prison in 1967, the wild-haired, earring-wearing, heavily tattooed Coe went straight for Nashville, where he lived in a hearse that he parked in front of the old Ryman Auditorium, the home of the Grand Ole Opry. Although he didn't conform to Nashville's professional standards, he soon gained the attention of the independent label Plantation Records, which released his debut album, Penitentiary Blues, in 1968. Followed within a year by a second volume, all of the songs on these albums were based on his prison experiences. Coe then toured with Grand Funk Railroad, a signal that he drew as much from rock's traditions as he did from country. Soon, he began performing in a rhinestone suit given to him by Mel Tillis, as well as a Lone Ranger mask, and began calling himself the "Masked Rhinestone Cowboy." Coe's concerts became notorious for their unpredictability -- frequently he would roar up on-stage astride his enormous Harley, swearing at the audience. He cultivated a large cult following with his act, but he couldn't break into the mainstream. However, other artists found success with his songs -- in 1972, Billie Jo Spears had a minor hit with his "Souvenirs & California Mem'rys," and in 1973, Tanya Tucker had a number one hit with Coe's "Would You Lay With Me (In a Field of Stone)." After Tucker's hit, Coe suddenly became one of Nashville's hottest songwriters; some of the biggest country artists -- including Willie Nelson, George Jones, and Tammy Wynette -- recorded his tunes, leading to his own contract with Columbia Records. 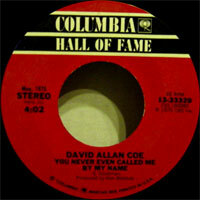 Coe's first two singles for Columbia didn't come close to the country Top 40, but his 1975 cover of Steve Goodman's "You Never Even Called Me by My Name" cracked the Top Ten. Although a string of moderate hits followed, he rarely cracked the country Top 40, although in 1977 Johnny Paycheck took Coe's "Take This Job and Shove It" to number one. During his 13-year association with Columbia, Coe released 26 albums, including the double-album set For the Record: The First 10 Years (1984), 1986's Son of the South (featuring Willie, Waylon, Jessi Colter, and other "outlaws"), and the highly regarded A Matter of Life and Death (1987). Although Coe had a successful career, it was one plagued with many setbacks. The conservative Nashville music industry frequently snubbed him and he had tax problems with the IRS; at one time, they seized his Key West home, and he went to live in a Tennessee cave until he got back on his feet. 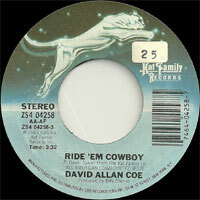 Toward the end of the '80s, Coe remarried and began to settle down. Throughout the '90s, he was a popular concert attraction in America and Europe. In addition to his musical career, he also acted in a few movies, including The Last Days of Frank and Jesse James. He also published a novel, Psychopath, and an autobiography. The LP Recommended for Airplay was issued in 1999. The new millennium saw the release of Long Haired Country Boy in 2000; Songwriter of the Tear appeared on Cleveland the following year. 1994 CD DAVID ALLAN COE 8 (US) STANDING TOO CLOSE TO THE FLAMES - Lead Me Not Into Temptation / Self Inflicted Wound / A Place Like This / I'm Not Begging You To Stay / Desperate Man / Standing Too Close To The Flame / When A Fool Becomes A Man / Revelation / Did You Know Elvis?